Acar, O. (2009). Evaluations for Trade and Trade Finance in Turkey. TEPAV Policy Note, July. Ahn, J. (2011). A Theory of Domestic and International Trade Finance. International Monetary Fund Working Papers, No.11/262. Ahn, J. (2013). Estimating the Direct Impact of Bank Liquidity Shocks on the Real Economy: Evidence from Imports by Letters of Credit in Colombia. International Monetary Fund, mimeo. Aldan, A. and Culha, O. Y. (2013). The Role of Extensive Margin in Exports of Turkey: A Comparative Analysis. Central Bank of Turkey Working Paper No.13/32. Amiti, M. and Weinstein, D. E. (2011). Exports and Financial Shocks. The Quarterly Journal of Economics, 126(4), 1841-1877. DOI: 10.1093/qje/qjr033. Antras, P. and Foley, C. F. (2013). Poultry in Motion: A Study of International Trade Finance Practices. Harward University, mimeo. Asmundson, I., Dorsey, T., Khachatryan, A., Niculcea, I. and Saito, M. (2011). Trade and Trade Finance in the 2008-2009 Financial Crisis. International Monetary Fund, Washington, D.C., IMF Working Paper No.11/16. Auboin, M. (2007). Boosting Trade Finance in Developing Countries: What Link with the WTO?. WTO Staff Working Paper ERSD, No. 2007-04. Auboin, M. and Engemann, M. (2013). Trade Finance in Periods of Crisis: What Have We Learned in Recent Years?. WTO Staff Working Paper ERSD, No.2013-01. Baldwin, R. (2009). The Great Trade Collapse: What Caused It and What Does It Mean?. In: Richard Baldwin (Ed. ), The Great Trade Collapse: Causes, Consequences and Prospects. London: Centre for Economic Policy Research (CEPR), p. 1-14. Behrens, K., Corcos, G., and Mion, G. (2013). Trade Crisis? What Trade Crisis?. The Review of Economics and Statistics, 95(2), 702-709. doi:10.1162/REST_a_00287. BIS (Bank for International Settlements). (2014). Trade Finance: Developments and Issues. Committee on the Global Financial System Papers No.50, Basel, Switzerland. Bricongne, J-C., Fontagne, L., Gaulier, G., Taglioni, D., and Vicard, V. (2012). Firms and the Global Crisis: French Exports in Turmoil. Journal of International Economics, 87 (1), 134-146. DOI: 10.1016/j.jinteco.2011.07.002. Chauffour, J.-P. and Farole, T. (2009). Trade Finance in Crisis: Market Adjustment or Market Failure?. The World Bank Policy Research Working Paper Series No.5003. Chor, D. and Manova, K. (2012). Off the Cliff and Back? Credit Conditions and International Trade during the Global Financial Crisis. Journal of International Economics, 87(1), 117-133. DOI: 10.1016/j.jinteco.2011.04.001. Contessi, S. and Nicola, F. (2012). What Do We Know about the Relationship between Access to Finance and International Trade?. Federal Reserve Bank of St. Louis Working Papers, No. 2012-054. Cunat, V. (2007). Suppliers as Debt Collectors and Insurance Providers. Review of Financial Studies, 20, 491–527. DOI: 10.1093/rfs/hhl015. Demir, B. (2014). Trade Financing: Challenges for Developing-country Exporters. CESifo Forum 15 (3), 2014, 34-38. Demir, B. and Javorcik, B. (2014). Grin and Bear It: Producer-financed Exports from an Emerging Market. CEPR Discussion Paper No. DP10142. Eck, K. (2012). The Effect of Cash-In-Advance Financing on Exporting during the Recent Financial Crisis-Firm Level Evidence from Europe and Central Asia. Bavarian Graduate Program in Economics, mimeo. Glady, N. and Potin, J. (2011). Bank Intermediation and Default Risk in International Trade-Theory and Evidence. ESSEC Business School Working Paper. Gros, D. and Selcuki, C. (2013). The Changing Structure of Turkey's Trade and Industrial Competitiveness: Implications for the EU. Centre for European Policy Studies (CEPS) Working Paper Series No.03. Hoefele, A., Schmidt-Eisenlohr, T. and Yu, Z. (2013). Payment Choice in International Trade: Theory and Evidence from Cross-Country Firm Level Data. CESifo Working Paper No. 4350. Iacovone, L. and Zavacka, Z. (2009). Banking Crises and Exports: Lessons from the Past?. The World Bank Policy Research Working Paper No.5016. ICC (International Chamber of Commerce). (2009). Rethinking Trade Finance 2009: An ICC Global Survey. Banking Commission Market Intelligence Report, ICC, Paris. ICC (International Chamber of Commerce). (2010). Rethinking Trade Finance 2010: An ICC Global Survey. Banking Commission Market Intelligence Report, ICC, Paris. IMF-BAFT (International Monetary Fund-Bankers' Association for Finance and Trade). (2009). IMF-BAFT Trade Finance Survey: A Survey among Banks Assessing the Current Trade Finance Environment. Report by FImetrix for IMF and BAFT, Washington, DC. ITA (International Trade Administration). (2012). Trade Finance Guide: A Quick Reference for U.S. Exporters. U.S. Department of Commerce, Washington, DC. ITC (International Trade Centre). (2009). How to Access to Trade Finance: A Guide for Exporting SMEs. Geneva, Switzerland. Kaminski, B. and Ng, F. (2006). Turkey's Evolving Trade Integration into Pan-European Markets. The World Bank Policy Research Working Paper Series No.3908. Kalkan, S., Dundar, H.C. and Dinccag, A. (2010). Trade and Trade Finance in Turkey: What is the Impact of the Finance Problems in the Decrease in Exports?. TEPAV Policy Note No. N201013. Kalkan, S. and Cunedioglu, H.E. (2010). Did Turkey’s Economy Recover from the Crisis? Did We Out-Compete Rivals?. TEPAV Policy Note No. N201029. Levchenko, A. A., Lewis, L. T. and Tesar, L. L. (2010). The Collapse of International Trade during the 2008-2009 Crisis: In Search of the Smoking Gun. NBER Working Papers No.16006. Love, I. (2013). Role of Trade Finance. In: Gerard Caprio (Ed. ), The Evidence and Impact of Financial Globalization, Oxford: Elsevier Inc., 199-212. doi:10.1016/B978-0-12-397874-5.00029-4. Malouche, M. (2009a). Trade and Trade Finance Developments in 14 Developing Countries Post September 2008. World Bank Policy Research Working Paper No.5138. Malouche, M. (2009b). World Bank Firm and Bank Surveys in 14 Developing Countries, 2009 and 2010. In: Jean-Pierre Chauffour and Mariem Malaouche (Ed. ), Trade Finance during the Great Trade Collapse. World Bank, Washington, DC, 173-199. Manova, K. (2013). Credit Constraints, Heterogeneous Firms and International Trade. National Bureau of Economic Research Working Paper No. 14531. Menichini, A. M. (2009). Inter-Firm Trade Finance in Times of Crisis. The World Bank Policy Research Working Paper Series No.5112. Mora, J., and Powers, W. (2011). Global Perspectives in the Decline of Trade Finance. In: Jean-Pierre Chauffour and Mariem Malaouche (Ed. ), Trade Finance during the Great Trade Collapse. World Bank, Washington, DC, 117-133. Niepmann, F. and Schmidt-Eisenlohr, T. (2013). International Trade, Risk and Role of Banks. Federal Reserve Bank of New York Staff Reports No.633. Olsen, M. (2013). How Firms Overcome Weak International Contract Enforcement: Repeated Interaction, Collective Punishment and Trade Finance. University of Navarra, IESE Business School, mimeo. Paravisini, D., Rappoport, V., Schnabl, P. and Wolfenzon, D. (2011). 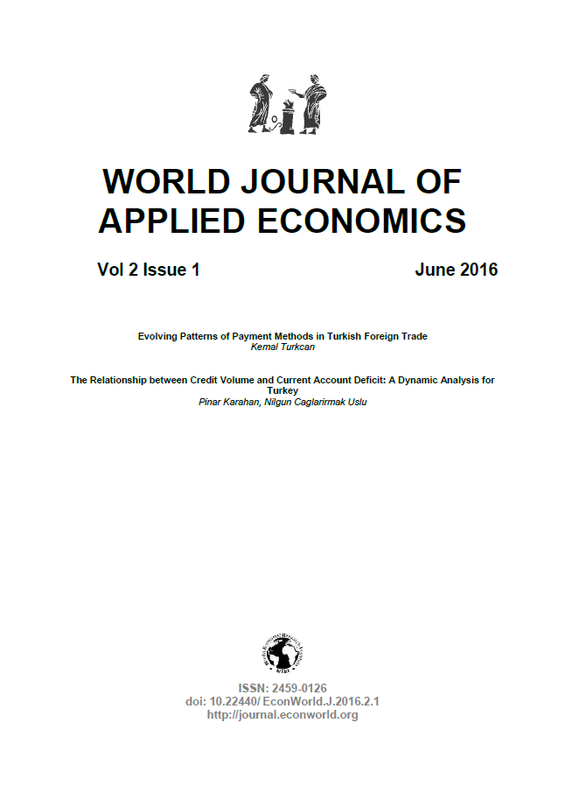 Dissecting the Effect of Credit Supply on Trade: Evidence from Matched Credit-Export Data. NBER Working Papers No.16975. Saygili, H. and Saygili, M. (2011). Structural Changes in Exports of an Emerging Economy: Case of Turkey. Structural Change and Economic Dynamics, 22, 342–360. DOI: 10.1016/j.strueco.2011.08.001. Schmidt-Eisenlohr, T. (2013). Towards a Theory of Trade Finance. Journal of International Economics, 91(1), 96-112. DOI: 10.1016/j.jinteco.2013.04.005. Turkcan, K. (2014). Investigating The Role of Extensive Margin, Intensive Margin, Price and Quantity Components on Turkey’s Export Growth during 1998-2011. Turkish Economic Association Discussion Paper No.2014/2.